Go on, admit it: you’d completely forgotten that Doncaster were in this division. Last, but not least, Donny make their way over to Spotland for Sunday’s game. with both parties having secured a top-four berth. 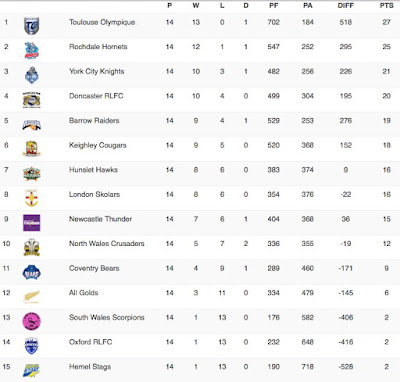 While Hornets look set for second-place (bar a defeat on Sunday and a 50 point win for York at Keighley), a Doncaster win and a defeat for York by the Cougars (who can now no longer improve on 6th) would hoist Donny into third - which brings with it a lovely trip to France. Finish fourth, however and TOCXIIIC come to you. Only the RFL could come up with that gem. But it’s a high-class problem to have. In this final ‘regular round’ it’s London Skolars’ turn to have a pop at non-full-time Toulouse. Having guaranteed a place in the 8, they should be full of confidence and it’d be nice to think that there could be an upset on the cards. 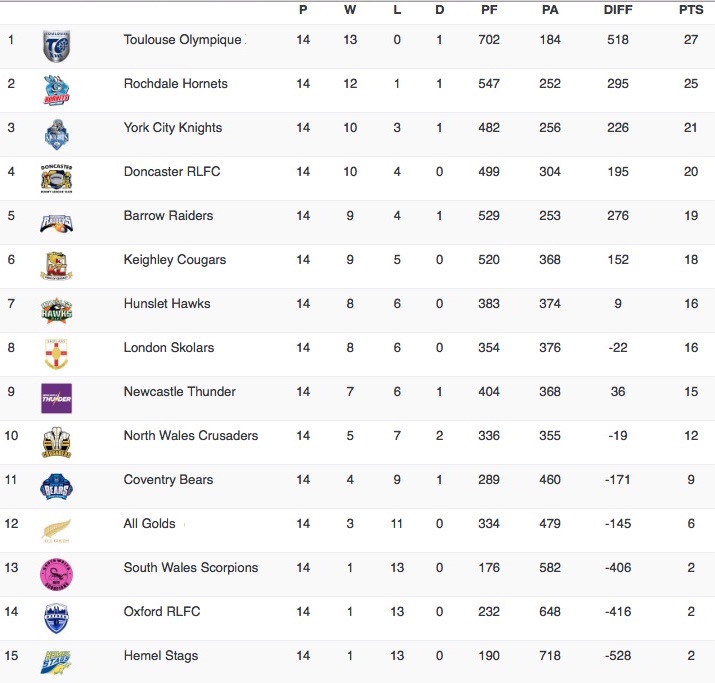 Further down the table, all eyes will be on Hunslet and Newcastle for who finishes in the dreaded 9th spot. Currently separated by a single point, Hunslet have the narrow advantage in the battle to prove which side can underperform the most this season. Newcastle ThunderFalcons make the long trip down to Hemel, so you have to fancy them to win, which puts pressure on Hunslet to get a win from the visit of Crusaders. This battle is made more interesting as both sides have identical points differences, so a Hunslet draw and a big Newcastle win could see the Hawks’ 2016 effectively dead in the water on points difference. And Crusaders already have two draws under their belt this season. You can hear the sphincters squeak from here. Speaking of which, Doncaster come on Sunday having ripped Hemel Stags a brand new bumhole in an 80-point thrashing at the Keepmoat last week. But coach Gary Thornton isn’t pleased with the 18 points they conceded. Speaking on the club’s website this week he said: “I’m not so pleased with the 18 points we conceded…” - wise words, mate. To be fair, he also said: “It is mind games, you are 18 points up against anybody and you take your foot off the gas a little bit and I want us to get away from that”. Alan Kilshaw will probably agree. When you look at Doncaster’s squad, it’s a robust, work-hard outfit, augmented by Papua New Guineans Jason Tali and the redoubtable Makali Aizue - who we reckon is 40 next year! Tali weighed-in with two tries last week - but most eyecatching was a hat-trick from prop Connor Scott. In Summary: threats, but mistakes. Hornets come into this final game before the inaugural split looking good in second place. Alan Kilshaw has done a great job in building on previous seasons’ work and has instilled a grittier, harder edge to a side that could always play, but could always have had a sharper ‘Killer’ instinct. Last week’s win over Keighley was an archetypal game of two halves: a first 40 of high-tempo intensity that blew Keighley away; the second forty a stubborn rearguard action as the visitors capitalised on a team bent completely out of shape and short on replacement bodies. For us, though, the moment that underlined Hornets’ determination was Ben Julilen’s counter-attacking overlap try when we were down to 12 men. We can’t wait though, for the contest between 'The Suva Express' Jo Taira and Makali Aizue - a big-hitting heavyweight contest that again pits PNG’s battle hardened veteran against Hornets’ fearless Fijian wrecking-ball tyro. Worth the admission money alone. See you Sunday. Keighley’s tormentor-in-chief was the ‘Suva Express’ Jo Taira who applied some frankly scary wrecking-ball technique in both attack and defence. Notwithstanding his punishing carries, his thunderous hit to force a drop-out that led to Jono Smith’s try after 55 minutes was worth the admission money alone. Hornets were in charge from the moment that Paul Crook’s spiralling kick-off found touch at 15 seconds after three. Two dumbass penalties from Keighley gave Hornets a platform deep in Cougar’s territory where James Tilley hit a flat-ball at pace to score. Crooky the extras, Hornets 6-nil up before Keighley had touched the ball. Buoyed by their start, Hornets went back down field where Danny Yates slipped a teasing kick with Dale Bloomfield in hot pursuit, pressure on a panicking defence resulting in a scrum. But an attempt to go wide quickly was foiled when Tom Lineham was shepherded into touch. No matter. On 13 minutes a blockbusting run from Jo Taira - that included an exquisite hand-off - drew a penalty; Danny Yates took a quick tap and, while Keighley were holding a post-mortem on what had just happened, Ben Julien skipped through to score. Crooky the two for 12-nil. Hornets continued to press hard and, on, 18 minutes Paul Crook and Jordan Case combined to create a pinpoint crash-ball hit by an unstoppable Wayne English at close range. Crooky cool as you like for 18-nil. On 22 minutes, Hornets targeted Keighley half Paul Handforth defending out on an edge. Having compelled him to make four consecutive tackles, Ben Moores went to him again, finding Ben Julien in space. He slipped the ball to Wayne English who - ankle-tapped - showed great vision and coolness to slip the ball out for Dale Bloomfield to score. Crooky on target: 24-nil. Keighley did rally briefly: Peltier chucking his weight behind a short pass to score from five metres. Hornets had the last word of the half when Paul Crook took the two after a string of Keighley penalties. Half time 26-6; Hornets in complete control. The second half was a patched-up, patchwork affair: Hornets losing Dave Cookson and Dale Bloomfield to injury, compelling a major reshuffle that saw Jono Smith play on the wing, Jo Taira switch to centre and props Samir Tahraoui, Matt Hadden and Woz Thompson heavily rotated in short shifts. But Hornets started brightly. An early penalty for a 3-on-one ball-rip was followed by a frankly stunning passage of play. Keighley scraped a a score against the run of play when Feather ducked in from acting half on the last tackle. Hornets’ response was swift: Paul Crook and Tom LIneham keeping the ball alive; Ben Moores a superb fingertips catch to score. Crooky the two 38-12. With a tiring Hornets inreasingly reshuffled out of shape, Keighley had their best spell of the game: two tries in six minutes for Martin, the first the pick of the brace involving a prestidigitous ball steal on Paul Crook that left both parties equally surprised. Somehow Keighley deigning to compete at 38-24. On 70 minutes Keighley launched an attack through Hornets’ right channel, where lump John Oaks was deemed to have been tackled by James Tilley before he received the ball. Tilley sin-binned: Hornets reduced to 12 for the remainder of the game. Keighley capitalised on their numerical advantage immediately, Rawlins trundling in out wide to close the gap to just 10 points. But it’s been at times like these where Alan Kilshaw’s Hornets have shown a steely resolve. Where previously we might have limped and struggled to the finish line, this side responded in the only way it knows how. With two minutes remaining an attritional approach set had Keighley retreating to their goal-line, where an audacious Ben Moores cut-out pass created space for Ben Julien to reach in and score by the corner post. In the end this game looked tighter than it really was. Only when Hornets were depleted did Keighley even look like competing. Indeed, the first half was as good as we’ve played all season. Slick, cohesive and clinical. Whilst the current clutch of injuries seem to have come at a bad time, Killer will also have one or two fit bodies back on deck next week for our final first-phase game before the Super 8s. Having secured at least third place, a win next week will seal second. And that, my fellow Hornets, will be a job well done.